This unique, 3-D model, is used to perform Leopold's maneuvers and to demonstrate palpation of the abdomen to determine fetal lie, presentation, and position. The model includes a fetus with a weighted body, movable arms and legs, firm buttocks, and a head with palpable anterior and posterior fontanels. The fetal body flexes to allow demonstration of all presentations and positions. 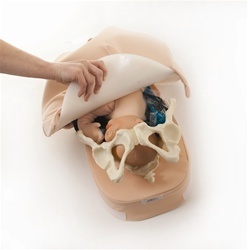 The fetus and vinyl pelvis rest within the abdominal portion of the model. The abdomen, a padded cloth attached by Velcro to the base, makes it easy to visualize and change fetal positions. Movable gel packs are included to simulate amniotic fluid. Comes with practice/resource guide to provide detailed suggestions on how to use the model. 19" x 11 ¼" x 9 ½".